Islamabad United vs Quetta Gladiators Live Streaming PSL Live Score Cricket Match: The ongoing Pakistan Super League 2017 returns after a rest of two days. Today, defending champions Islamabad will play against Quetta in Sharjah. The cricket competition didn’t kick off on a good note rather bagged headlines for fixing issues for the first few days. Several players have been suspended for the alleged involvement in a fixing scandal. It’s a tough time for United as its two players have been suspended for the same. At this point, IU needs to focus on the future forgetting every old incident that had taken place in the past. The two-day rest should have been helpful in devising new strategies to tackle competitors. They have to play a lot better against QG as they have been playing brilliantly so far in the PSL 2017. Quetta has won both of its matches. United may be looking forward to beating them as they need to register victory to keep their hopes alive for the next level. Both the sides know very well that they need to be consistent to reach the finals. Both the teams look good on paper having quality players. Islamabad’s batting lineup is strong with Dwayne Smith, Sam Billings, Brad Haddin, Misbah-ul-Haq, and Shane Watson. All of them have the capability of registering victories on their own. Bowling department also looks strong with Mohammad Sami and Saeed Ajmal who would be enough to restrict Quetta batsmen from scoring runs. Quetta is equally strong with players like Ahmed Shahzad, Kevin Pieterson, and Rilee Rossouw. They are expected to perform and score good runs. It would be a feast for eyes to watch out both the teams fighting for the win. Sharjah audience will have a quality time watching the game unfolds. Traditionally, the T20 format is considered to be the game for the batsman, but bowlers too have a significant role to play. They restrict the batsmen from scoring big runs and even dismiss them for very little runs. Islamabad, as well as Quetta, seems to be balanced. The team which plays consistent cricket will win eventually. 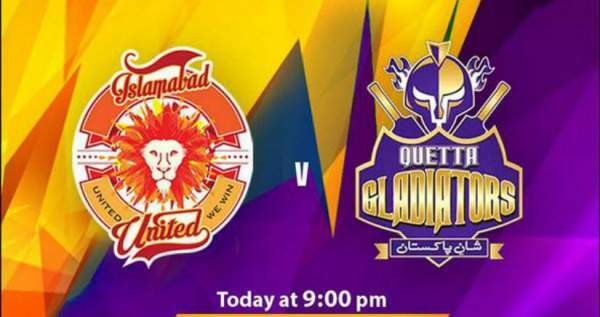 Islamabad United vs Quetta Gladiators Live Streaming starts at 8 pm local time (9:30 pm IST and 9 pm PKT). The entire live stream, TV options are available here. Pakistan: TV: Ten Sports, PTV, and Geo Super. Live Cricket streaming: PTV Sports Live. UK: TV: Prime TV. Live stream: Prime TV Online.